WHAT is a person’s normal temperature?—is a question often asked of every physician. 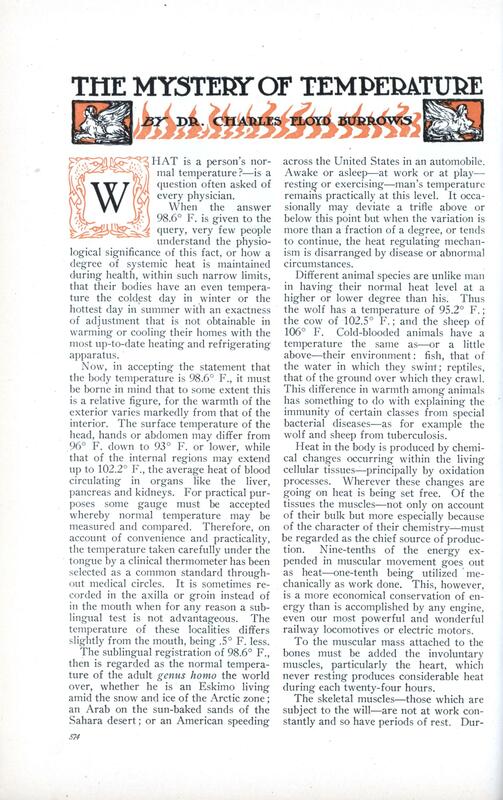 When the answer 98.6° F. is given to the query, very few people understand the physiological significance of this fact, or how a degree of systemic heat is maintained during health, within such narrow limits, that their bodies have an even temperature the coldest day in winter or the hottest day in summer with an exactness of adjustment that is not obtainable in warming or cooling their homes with the most up-to-date heating and refrigerating apparatus. 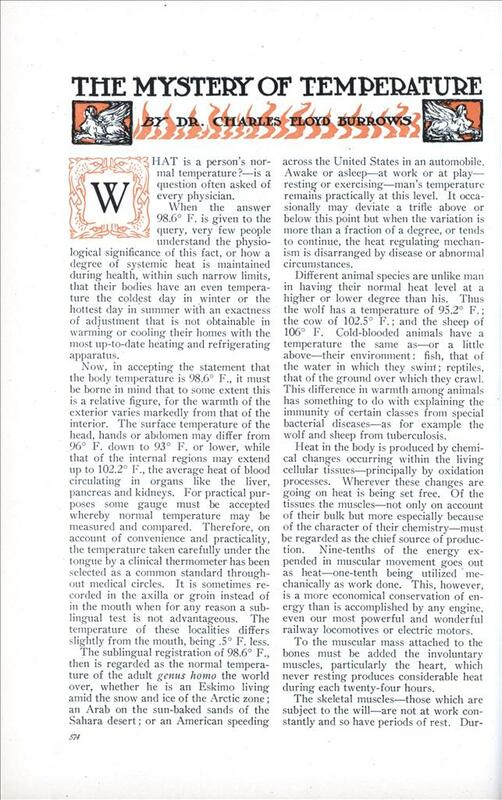 Now, in accepting the statement that the body temperature is 98.6° F., it must be borne in mind that to some extent this is a relative figure, for the warmth of the exterior varies markedly from that of the interior. The surface temperature of the head, hands or abdomen may differ from 96° F. down to 93° F. or lower, while that of the internal regions may extend up to 102.2° F., the average heat of blood circulating in organs like the liver, pancreas and kidneys. For practical purposes some gauge must be accepted whereby normal temperature may be measured and compared. Therefore, on account of convenience and practicality, the temperature taken carefully under the tongue by a clinical thermometer has been selected as a common standard throughout medical circles. It is sometimes recorded in the axilla or groin instead of in the mouth when for any reason a sublingual test is not advantageous. The temperature of these localities differs slightly from the mouth, being .5° F. less. 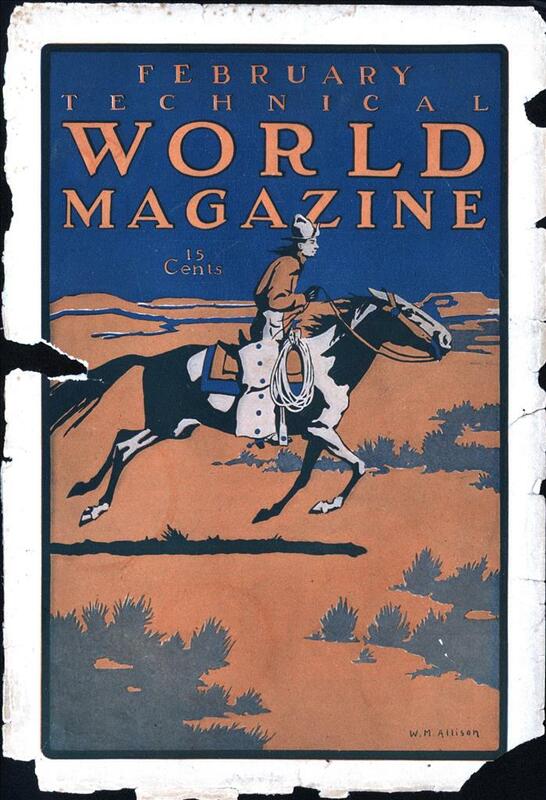 The sublingual registration of 98.6° F., then is regarded as the normal temperature of the adult genus homo the world over, whether he is an Eskimo living amid the snow and ice of the Arctic zone; an Arab on the sun-baked sands of the Sahara desert; or an American speeding across the United States in an automobile. Awake or asleep—at work or at play-resting or exercising—man’s temperature remains practically at this level. It occasionally may deviate a trifle above or below this point but when the variation is more than a fraction of a degree, or tends to continue, the heat regulating mechanism is disarranged by disease or abnormal circumstances. Different animal species are unlike man in having their normal heat level at a higher or lower degree than his. Thus the wolf has a temperature of 95.2° F.; the cow of 102.5° F.; and the sheep of 106° F. Cold-blooded animals have a temperature the same as—or a little above—their environment: fish, that of the water in which they swim; reptiles, that of the ground over which they crawl. This difference in warmth among animals has something to do with explaining the immunity of certain classes from special bacterial diseases—as for example the wolf and sheep from tuberculosis. Heat in the body is produced by chemical changes occurring within the living cellular tissues—principally by oxidation processes. Wherever these changes are going on heat is being set free. Of the tissues the muscles—not only on account of their bulk but more especially because of the character of their chemistry—must be regarded as the chief source of production. Nine-tenths of the energy expended in muscular movement goes out as heat—one-tenth being utilized mechanically as work done. This, however, is a more economical conservation of energy than is accomplished by any engine, even our most powerful and wonderful railway locomotives or electric motors. To the muscular mass attached to the bones must be added the involuntary muscles, particularly the heart, which never resting produces considerable heat during each twenty-four hours. The skeletal muscles—those which are subject to the will—are not at work constantly and so have periods of rest. During these periods chemical changes of a subdued type—changes which produce heat, nevertheless—are going on within them. This quiescent mutation gives rise to a certain quantity and this added to the amount produced by the voluntary and involuntary movements which go to make up our daily life, at work or at play, accounts for a large proportion of the heat of our bodies. Next to the muscles in amount of heat production comes the various secreting glands as the liver, pancreas and kidneys. Even the brain generates its quota as does nearly every physical tissue-though the total from some must be very small. The liver on account of its remarkable size, blood supply and constant activity, produces a large quantity. Indeed the blood in the hepatic vein is the warmest in the body. Hence, taking a survey of our anatomy and looking at the subject from a quantitative point of view, the muscles and the glandular organs are the main sources of heat replenishment and are the combustion centers which have most to do with keeping us warm. But heat while constantly being produced, is as continually being lost by the skin, the lungs and in other ways. The swiftly circulating blood carries it from the regions of production to organs and tissues where it is lost by radiation, conduction and the evaporation of water, and so equalizes the warmth of the various parts and tends to maintain a uniform temperature. Normal temperature during health is kept within exceedingly narrow limits. It is obvious that this even normalcy may be produced in one of two ways: either by increasing heat production, or decreasing heat loss. It is evident also that the nervous mechanism which exactly co-ordinates the loss and production of heat must be indeed a sensitive one. About 80 per cent of heat is thrown off through the skin by radiation, conduction and the evaporation of perspiration ; and about 15 per cent by the respiratory apparatus in warming the inspired air and in the vaporizing of water from the air passages. In the dog, an animal which does not perspire freely, respiratory heat loss is an important means of regulating his temperature. Everyone is familiar with the facility with which a canine lolls and the rapidity of the panting respirations which accompany this act. The 5 per cent balance of heat expenditure is accounted for in the warming of the excretions. The skin is the great heat eliminating agent and accomplishes this by a double action. In the first place it controls loss of heat by means of the vascular mechanism. Thus dilatation of the cutaneous vascular areas is accompanied by a larger flow of blood through the skin and this tends to cool the body by allowing freer radiation and conduction and more evaporation of sweat. Conversely, any influence which constricts the blood-channels of the skin and dilates the blood-vessels of the interior will cause a decreased flow through the surface and an increased flow through the abdominal territory—so tending to preserve or increase the bodily warmth. In the second place the skin — through the nerves governing the perspiratory glands and the production of perspiration — acts still further and promotes or lessens heat loss by sweating. The evaporation of perspiration absorbs large quantities, of heat. The amount of fuel gas required to vaporize a pint of water will convince anyone of this assertion. Oarsmen at Poughkeepsie, N.Y., in the annual rowing races, over a four-mile course, often lose as much as eight pounds in weight in less than twenty minutes. A large percentage of this loss is caused by the free evaporation of perspiration. The working of the heat regulating mechanism is observed best during exercise. The muscular contractions increase heat production rapidly. Simultaneously the breathing is hastened and more air is respired; the heart beats faster and the circulation of the blood is accelerated; the cutaneous vascular areas dilate; the skin perspires copiously; and so an amount of heat is expelled by these means, sufficient to neutralize the extra production. The sense of heat which one experiences during exercise is due to the flushing of the skin with warm blood and the appreciation of this condition through the sensory nerves. Under the influence of moderate warmth, artificially applied, the cutaneous bloodvessels dilate and heat is lost as fast as absorbed. If the skin can perspire freely at such times, excessively high measures of heat may be borne for several minutes by an individual without raising his temperature hardly a fraction of a degree. Persons who sometimes are styled “human salamanders” have given exhibitions of their ability to withstand high temperatures. There is an authentic case recorded of Martinez, the so-called “French salamander”—a baker by trade —who exposed himself to high temperatures from boyhood. He remained in an oven erected in the Gardens of Tivoli for fourteen minutes when the oven was 338° F. His pulse on entering was 76 per minute and on coming out 130. He often duplicated this feat— the thermometer varying from 250° F. upward to 338°. Chamouni, a celebrated “Russian salamander,” assumed the title of “The Incombustible.” His “stunt” was to enter an oven and remain while a leg of mutton was roasted—not retiring until the meat was well done. He eventually lost his life by one of these performances. These illustrations simply serve to show what remarkable heat changes a human body is able to undergo and temporarily adjust itself to. Habit and practice help to accomplish toleration, for a “green hand” could not stoke many minutes in the boiler room of a transatlantic liner without being overcome, and yet seasoned stokers work for comparatively long periods. The effect of great external heat if long continued, or if associated with physical activity and much humidity of the atmosphere, may produce a state of affairs known as heat-stroke. When this condition is caused by solar action, as occurs frequently among the inhabitants of our cities during the hot summer months, it is generally distinguished as sun-stroke. In either form of prostration, heat is accumulated by constant production and also by external absorption, and soon the thermotaxic center is so embarrassed and overwhelmed by the rapid accumulation, that failure upon its part occurs and tumult reigns. The symptoms arising vary: sometimes the heart succumbs, sometimes the respiration ; at other times, convulsions supervene; and commonly death results through a comatose condition of the brain. Mammalian muscle becomes rigid and coagulates like the white of an egg at about 130° F., so that sudden rigor mortis from heat might arise could the temperature of the body be raised suddenly to this point without death ensuing first from other causes. The production of heat by the several tissues of the body is regulated further in a remarkable manner, for it is not altogether by loss of heat that the even temperature of man and warm-blooded animals is maintained. Variation in the amount produced constitutes an important factor, not only in preserving bodily warmth, but also in generating the fever which characterizes various diseases. In the lower portion of the brain, physiologists have located a nervous center which, through reflex stimulations from the surface of the body—and by other means more or less obscure—is able to co-ordinate heat production with heat loss. This region is known as the thermotaxic nervous mechanism. It is comparable to the vascular mechanism and to the various other nervous mechanisms which govern glandular secretion and is probably closely connected with each. Many of the maladies of suffering humanity are characterized by fever. Fever is a rise of temperature above the normal level. This rise is seldom beyond 106° F.—; if above this point, it is called hyperpyrexia. Fever indicates some bodily disturbance and is usually caused by the products of disease circulating in the blood and stimulating the thermotaxic brain center in such a way that more heat than the body needs is produced. Mental and nervous influences may so act for a time as to disorder the control of this nerve center and cause fever. Other agencies like injuries and brain tumors also induce the same result. It is interesting at this point to note some of the high temperatures which are on medical record as having actually occurred in certain diseases. Guy’s Hospital in London records the case of an hysterical woman afflicted with tuberculosis of one lung. The average clinical thermometer was unable to register her fever and so the physicians finally obtained one with a scale reading up to 130° F. The woman objected to the use of this instrument, saying it was a “horse thermometer.” However, on October 15th, 1879, they succeeded in obtaining a reliable temperature of 128° F.
At a meeting of the Association of American Physicians in 1895, Dr. Jacobi of New York reported a patient in whom fever reached the almost incredible figure of 148° F. . This case occurred in an hysterical fireman who had suffered a severe injury from a fall. This instance is reliable for Dr. Jacobi used every possible means to prevent fraud and insisted that his observations had been made with the greatest care and precision. Dr. Jacobi’s reputation for accuracy and veracity are too well known for one to doubt his statement. Fever is not the only disturbance which may alter temperature. Certain conditions—especially those due to diseases like tuberculosis, acute alcoholism, melancholia, convalescence from fevers, poisoning from various drugs, and so forth— may cause the bodily warmth to become subnormal. Injuries and surgical shock also originate the same effect. Starvation always induces a gradual fall and this lowering of temperature in turn further diminishes tissue change and so production of heat. A vicious circle thus is established and death soon may be produced. Life in such cases can be prolonged if the body is protected so as to economize the loss of heat. Low temperatures are always dangerous and unless a reaction quickly ensues, by aid of relief measures, a fatal termination may be expected. The lowest recorded during life that may be regarded as reliable, is one reported by Duffy in which the thermometer registered 84° F. Death ensued the following day. The effect of great external cold upon the “body is practically the reverse of that of extreme heat. The chemical metabolism, or tissue change is lowered; little warmth is produced; the muscles “fall to pieces” less rapidly; the action of the heart and respiration becomes slowed; drowsiness develops and a condition analogous to sleep is soon produced—which gradually and insensibly deepens into the sleep of death. The body, however, can withstand extreme cold more resistibly than it can extreme heat before the regulating center becomes disordered ; and so—other things being equal—freezing to death is not as common in cold climates as sunstroke is in warm. Certain animals—the bear, woodchuck, dormouse and others—undergo in the winter time a peculiar reaction to cold which is known as hibernation. When the frosts of this season approach, there ensues a depression of tissue change; a considerable reduction of temperature; and a lowered activity of all the organs and functions of their body. They be take themselves to some protected quarter which their instinct selects and fall into a deep sleep or torpor. The heart beats slowly and breaths become few and feeble until the respiration and circulation are reduced to the lowest rate consistent with a prolongation of life; and the chemical changes in their anatomy are so diminished that the venous blood is often the color of arterial. When warm weather returns in the spring, these animals awaken from this strange torpidity and life returns in all its vigor. Everyone has heard the weather prophet’s story of the ground-hog coming out of his hole on Candelmas day and how, if he sees his shadow, he returns for six weeks more of winter. This tale may be true, for hibernation can be interrupted by the application of external heat or even induced in summer by artificial cold. Human hibernation is an anomaly very infrequently observed yet authentic medical literature records a few examples of this condition, which, if not analogous to the hibernation of animals in every respect, is distinguished by about the same characteristics and is so nearly similar as to be impossible of a practical differentiation. A few of the fakirs of India—a curious sect of Oriental religious ascetics—have the faculty of going into a trance-like state at will in which animation is temporarily suspended; the temperature of the body falls considerably below nor- mal; the respiration becomes exceedingly faint; and the pulse almost is indiscoverable. They have the power of remaining in this condition for comparatively long periods and when they gradually return to consciousness they appear weak, emaciated and haggard. Before attempting one of these performances they usually take a large dose of a narcotizing drug called “bang” and when partially stupefied are put in some cool, quiet tomb-like place which in itself favors the prolongation of this hibernating period. Here they remain undisturbed during their lethargy. The stories of the exhibitions of these fakirs have been largely discredited by non-observers but those persons who actually have witnessed them believe in their genuineness. Upon the authority of Sir Claude Wade it is recorded that in Lahore, India, in 1837 a fakir was buried in the ground and was not dug up until a period of six weeks had elapsed. Every possibility of fraud and deception was prevented and the grave was guarded day and night by soldiers. When the man was disinterred he had the appearance of being dead but shortly afterward was restored to life. A German physician, Honigberger by name, employed by Runjeet Singh, an Indian Maharajah, narrates a case of another fakir who permitted himself to be imprisoned in a secure vault. The box in which he was enclosed was firmly fastened and sealed with a government stamp. Grain was sown in the ground above his resting place and put forth leaves ere he was removed. Altogether he was confined over forty days. Dr. Honigberger also affirms that later this same man was four months in a grave in the mountains; was brought back to life; and lived many years afterwards. Sir Henry Lawrence attests the reliability of these statements of the doctor. While such examples as these are almost incredible to the average person nevertheless they are not impossible. If hibernating animals can go weeks and months in some sequestered spot without food or drink—their body processes meanwhile almost on a level with death— it is safe to assume that human beings likewise may do the same thing in isolated and rare instances. Medical records of man contain even more remarkable and seemingly unlikely anomalies than this. The regulation of the temperature of the body then is one of the many wonderful functions of the human machine. When we pause for a moment and consider the intricate association existing between the muscles, glands and nerves themselves; their further complicated connection with the circulation of the blood and respiration; and the delicate brain mechanism which accurately coordinates this entire relationship under constantly changing conditions so as to maintain our normal temperature in health at an even pitch, the mystery of life deepens, and with reverence and awe, we remember that our Creator constructed us fearfully and wonderfully.